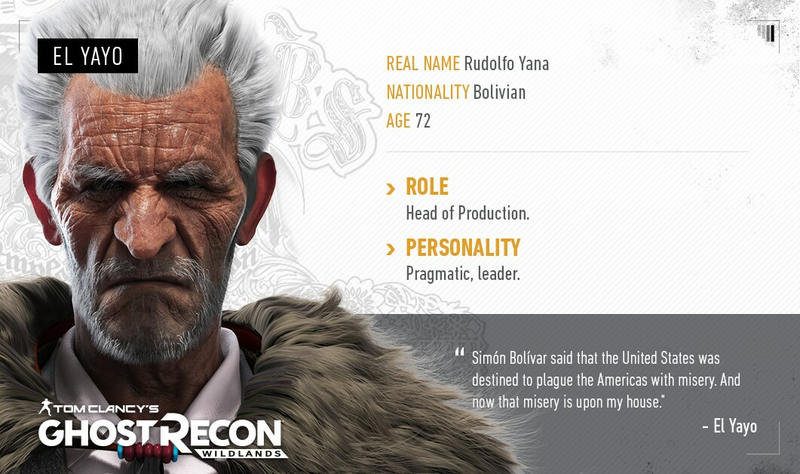 Rudolfo Yana, aka El Yayo (the Grandfather), is a man willing to work with anyone to protect his people. Some would call him a traitor, but others would define him as a true survivor. El Yayo was a coca union leader, but his ambition quickly led him to become a major drug producer in Bolivia. He first organized the cocaleros into a medium-level cocaine production operation. But when the Santa Blanca cartel set its eyes on his country, they threatened El Yayo’s family and he was forced to work for them. He’s currently the highest ranking Bolivian in the organization. El Yayo prefers making deals over resorting to violence, but his traditional values could become a problem if the drug production demand continues to grow. Under pressure, El Yayo will have to choose where his loyalty lies. According to our narrative director, Sam Strachman, "El Yayo is interesting because he works for Sueño as a way to protect his family and his country. He doesn’t produce cocaine by choice. He does it because it’s the only way to keep his people alive. At the same time, he has this attitude of, 'If you want me to stop making it, then you should tell people to stop buying it.'" Prepare yourself for the mission and read more about the Santa Blanca cartel members. You can check out more profiles by following this link. Let us know what you think about the Santa Blanca Cartel on our official forums and subreddit. Also, make sure to keep your eyes on ghostrecon.com for upcoming announcements and news!